Our partners in outdoor recreation, working together to make North Dakota a great place to ride. 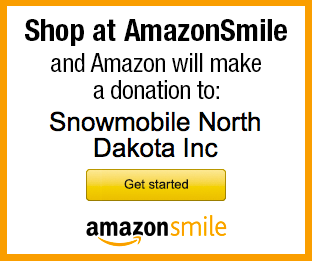 The North Dakota Parks and Recreation Department contracts the Snowmobile North Dakota Trail Program to manage the state snowmobile program under the general administration and direction of the Department. The Recreation Division team made up of staff from both organizations works hard to bring the best in motorized recreation to the state. 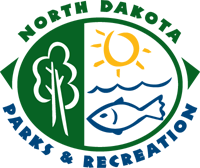 The North Dakota Parks and Recreation Department is the state agency charged with administering selected parks and recreation areas that are deemed to have state-wide or regional significance. 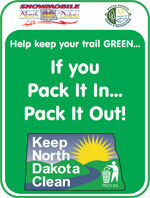 Snowmobile North Dakota partnered with Keep ND Clean (KNDC) in 2009 to promote “Greener” snowmobile trails! The partnership promoted to “If you, Pack it in… Pack it Out”, by placing trail signs across the state on the snowmobile trails. In 1968 KNDC Inc. was formed to ensure a continuous statewide program of education for beautification of the state and the proper disposal of litter. KNDC believes education is the key to any successful program. When people are informed, they are more apt to think before they throw. And to be truly effective, the education process needs to begin early. That is why KNDC holds an annual statewide poster contest for students in grades one through eight and special needs students. The North Dakota Scenic Byway Program is a collection of scenic roadways that embrace the beauty of North Dakota and showcase the diversity of its landscape. The success of the scenic byway program is dependent upon dedicated byway leaders and volunteers. The North Dakota Scenic Byway Program was created in 1996 by the North Dakota Department of Transportation (NDDOT), North Dakota Parks and Recreation Department (NDPRD), and North Dakota Tourism Department. Today, the program is administered through a cooperative effort between the NDDOT and NDPRD. The NDPRD manages the program with leadership from the state byway coordinator. 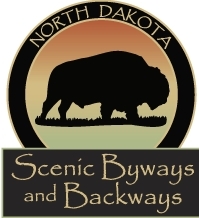 North Dakota has 10 designated scenic byways or backways. Two byways are also nationally designated. To qualify for designation, a roadway corridor must possess strong characteristics which fall under at least one of the following intrinsic qualities: scenic, natural, historic, cultural, archaeological, recreational.